Yacyretá: One reserve, lots of different habitats! Silvia Centron and Arne Lesterhuis of Guyra Paraguay putting up a mistnet in Yacyretá Reserve. 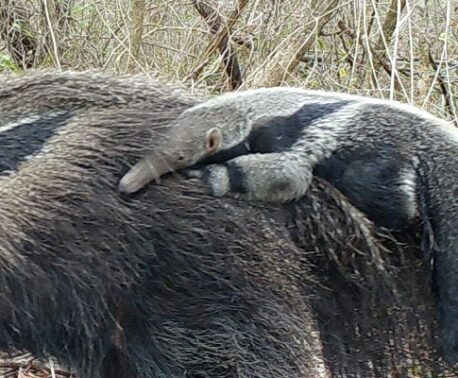 Yacyretá: Almost all the habitats of Paraguay in one location! 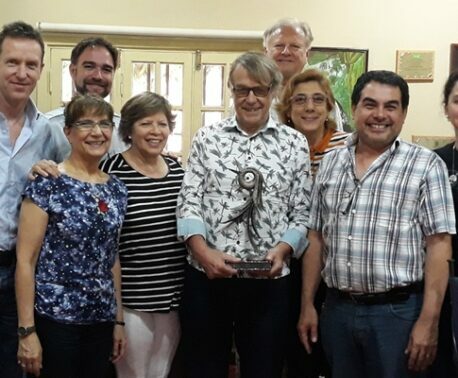 All troubles sorted, I went off to help with bird ringing in Yacyretá, a private nature reserve in south of Paraguay located on the border with Argentina. The Yacyretá reserve is owned by the company of the same name and situated around the dam built and managed by the company. The area is a bit surreal: The whole town, or suburb rather, was built by the company to house its workers, so has a slightly artificial feel to it. 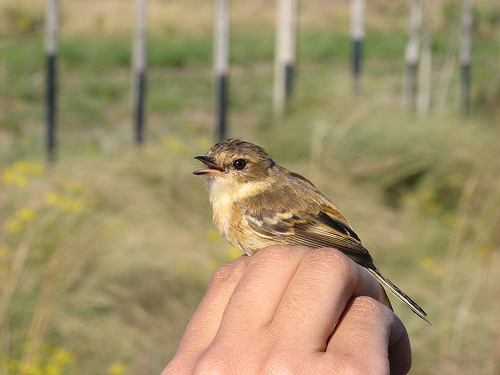 While the construction of the dam invariably had an impact on the environment and local community, the company is now investigating in conservation and Guyra Paraguay is helping with among other things the monitoring of bird species in the reserve. And there are a lot of birds! The reserve features everything from dunes and wetlands, through scrub, grassland and palm savannahs to Atlantic forest, each habitat type with its own specific bird species. 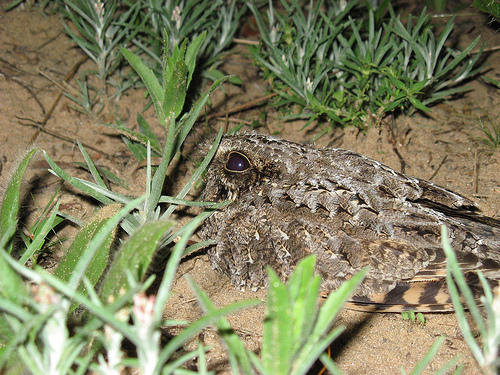 Sickle-winged Nightjar (Eleothieptus anomalus) resting on the road side after having been measured and weighted. We arrived at sunset after a five hour drive from Asunción and had no time to rest: Although our primary aim was to do some mist net trapping of two target species (more on this later), we were also going to undertake another bird monitoring project: Mark-release-recapture studies of the rare Sickle-winged Nightjar (Eleothieptus anomalus), which occurs as a small population at Yacyretá, and is active at dusk. 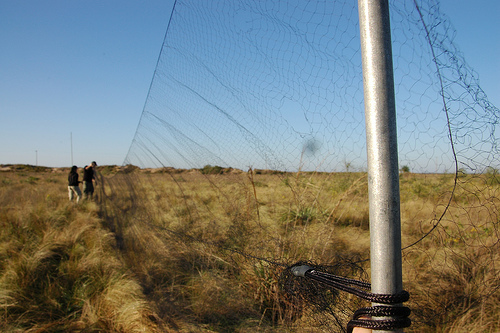 If mistnet trapping is the bird monitoring version of a beach holiday, with plenty of sitting around in the sun and the occasional stroll to coax birds towards the net, searching for the Sickle-winged Nightjar was more like an action-adventure trip for offroad junkies: In the light of the full moon, one person drove the 4×4 truck across the incredibly bumpy, sandy tracks of the savannah grasslands, with the other two standing on the back, holding on for dear life with one hand (well, I was anyway) and scanning the pitch-black fields with a torch in the other, hoping to catch the reflection of the birds' red eyes in the light. Not the easiest thing in the world, and I'm sure the health and safety obsessed UK volunteering organisations would disapprove, but it was great fun and very good exercise for both arms and legs. And since I was holding the binoculars at face height every day and the torch every night for five days consecutively, I'm convinced I ended up with toned biceps! Bearded Tachuri (Polystrictus pectoralis) being photographed before its release. I was completely overwhelmed with the number of birds we saw and the species list I was making was beginning to be so incomplete as to be completely worthless, but I carried on regardless – I wanted to get an idea of how many species you can expect to see without going into enormous trouble. Apart from birds and Howler monkeys we also saw otters, capivara, caimans, iguanas, deer, rabbit and what I would like to think was a Maned Wolf, but was probably a smaller fox or racoon. Howler monkey feeding on the flowers and shoots of a tree. 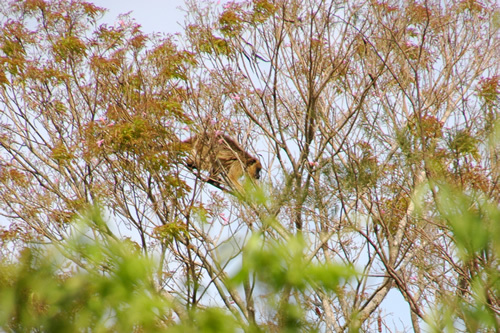 On our last day in the Reserve, we stumbled upon a whole family of Howler monkeys in the forest, right next to the trail, where we had previously just seen the odd individual and heard the howling of the rest of the group in the distance (which sounds just like the howling of the wind between the trees!). Amazed, we stopped to watch and photograph them as they moved effortlessly from tree to tree, grunting quietly and munching on petals and shoots. As we finally decided we'd seen enough and continued walking along the trail, the monkeys apparently decided that they too had had enough, and proceeded to throw faeces at us from the tree tops! Luckily we were out of range, but it was an interesting way to finish off our visit, and a reminder of who is in charge in the Atlantic Forest.